Tomorrow is National Organize Your Home Office Day for 2011. While many will be focused on finally filing that growing pile of documents and receipts on their desk, actually implementing a filing system that has some logic behind it, or tweaking the feng shui of the physical office environment in some way, it is just as important to take some time out to clean up your digital office--the PC. The PC is the centerpiece of office productivity. It is the heart and soul of the office, and when it is in cluttered disarray everything else suffers. With some help from iolo--makers of System Mechanic, here are five tips to help you clean and organize your PC. 1. Uninstall. Uninstall programs that you no longer need or use. They take up space on your hard drive, may be loading in memory and wasting system resources, and represent a possible security risk since you are unlikely to patch or update software you aren't even using. Some software applications include an uninstall option in the Start Menu folder. The best place to start, though, is the Programs and Features option in the Windows Control Panel. 2. Delete. Delete unused, old or duplicate files, e-mails, e-mail addresses, bookmarks and favorites. The average American adult has more than 1,800 digital files, according to the Consumer Electronics Association. That number goes up dramatically, once you factor in all the duplicate, unused or old files that unnecessarily take up your hard drive's space and make searching for the files you need more time-consuming, and grinding on your processor and hard drive. 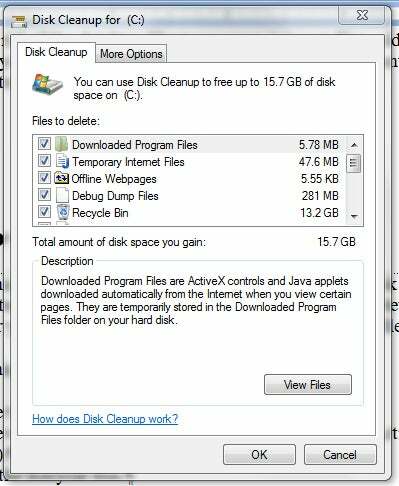 The Disk Cleanup utility in Windows is one good way to identify and remove unnecessary bits from your hard drive. 3. Clean. Once you've uninstalled unused programs, make sure to clean out your registry as well. Invalid or out-of-date registry settings can slow down your computer's boot time and cause weird hesitations and freezes during its operation. Messing with the Windows registry can have catastrophic consequences if done wrong and identifying and removing unnecessary registry entries is easier said than done. This is one area where using a third-party tool like System Mechanic makes sense. 4. Organize. Organize your files. Once unneeded programs are uninstalled, unused or duplicate files deleted and registry cleaned out, make sure the rest of your files are well-organized. Use a logical file naming system and put files into folders that make sense and are easy to remember and access. You can group files chronologically, or by customer, or by project--it is up to you to determine a system that makes the most sense for you and keeping your digital office functional and tidy. 5. Personalize. Personalize your computer. More personalizing helps you remember things and be better organized. Moreover, with a computer that's configured to suit your needs, you are more likely to remain better organized following Organize Your Home Office Day and throughout the year. Explore things and do not hesitate to right click on different tools. The Control Panel is the best place to begin.